We are the team representing Singapore in the Social Innovation Relay! The four of us are 17 this year, and all study at St Joseph’s Institution, where we took part in the competition through the school’s social enterprise club Prism. We participated in the Social Innovation Relay challenge organised by Junior Achievement Europe and NN Group. This is a competition where students come up with innovative business ideas that also benefit society. Our team’s idea, InTuition was to create an online learning platform for students around the world to exchange knowledge and encourage peer-to-peer learning. We were very lucky to represent Singapore in the global competition and won first place. As our prize, we just came back from the annual JA Alumni Europe Conference held in Prague, Czech Republic where we met and learnt from entrepreneurs all over Europe. Although most of us do not plan to start our own businesses at the moment, this competition allowed us to develop further in many other ways. Firstly, we learnt how to manage time well as we undertook this competition alongside our schoolwork. We also had to learn to work as a team because there were times where we had different opinions and ideas, but had to settle on a common ground. Finally, we improved much on our presentation skills throughout this competition, and gained confidence in public speaking. 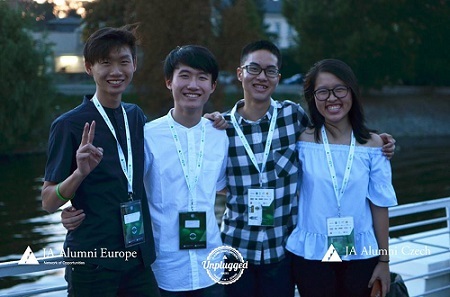 By fully sponsoring our trip to Prague, NN Group provided an amazing opportunity to attend the JA Alumni Europe Conference in the beautiful city, where we made memorable experiences and friends alike. Moreover, we have learnt from some of the best entrepreneurs in their respective fields of business. Before this experience, our thoughts and perspectives were relatively constrained as we’ve always taken a very conventional, safe approach to life. However, after being given the opportunity to interact and socialize with people from all over the world, I feel like we’re able to think bigger and better. We’ve also picked up some pointers from others alike who have embarked on a similar journey, and it was inspiring to hear their success stories. We have plans to carry out our idea in hope that one day it can become a tangible product. However, due to the staggering amount of schoolwork, we have not been able to achieve much progress. We hope to start working on the platform after our Promotional exam. We would definitely recommend this programme to our friends. This journey has inspired us to explore our interests while working towards something that is bigger than us. We’ve learnt how to be effective and efficient in the work that we have to accomplish, and it has broadened our perspectives about the world and its people. Everything was enjoyable and we have no regrets participating in this programme. We believe that this could help to enrich and the lives of other students like us as well.